Shortlisted at the Scottish Design Awards 2017 in the Future Building category, the project provides a new public-facing entrance to a nineteenth century building, as well as a new wing of flexible open plan office space and meeting accommodation. 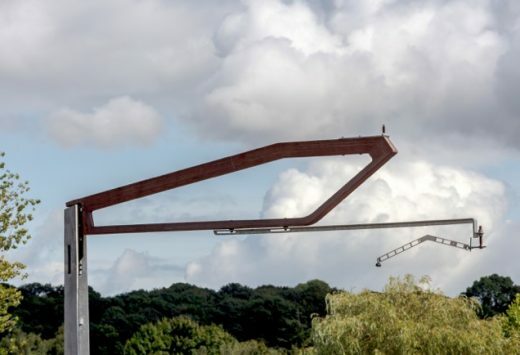 Moxon and Mott MacDonald have unveiled their prototype for a cost effective, low maintenance and visually sensitive alternative to the overhead line structures currently used for conventional and high-speed rail projects. 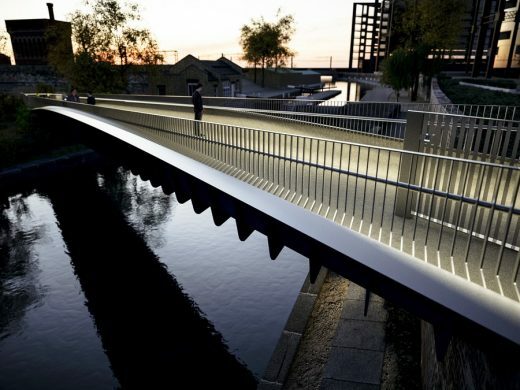 Moxon Architects and CampbellReith consulting engineers have submitted a planning application to the London Borough of Hounslow for a new footbridge beneath the existing Grade II listed Barnes Bridge, in Dukes Meadows, Chiswick. 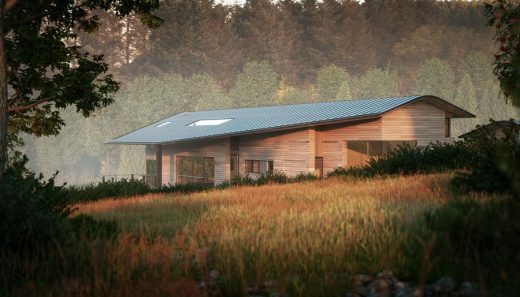 This architectural firm are developing new build premises for their studio in the Scottish Highlands. The 400 sqm facility has received planning permission.The studio will become the permanent base for the expanding Scottish arm of Moxon, who continue to grow their original London office. 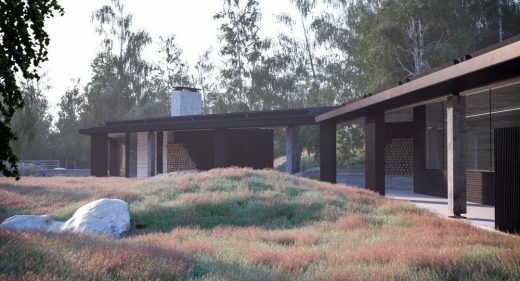 Set in the rolling landscape of Lower Deeside, Strachan House is a contemporary family home set into a steep landscape, made up of a series of connected volumes that utilise the banked terrain. Working closely with Arup, this expert bridge designing practice have designed an incredibly slender steel plate structure. The bridge is only 15mm thick and yet ingenious engineering solutions mean that the entire 38-metre crossing is spanned without any intermediate support. 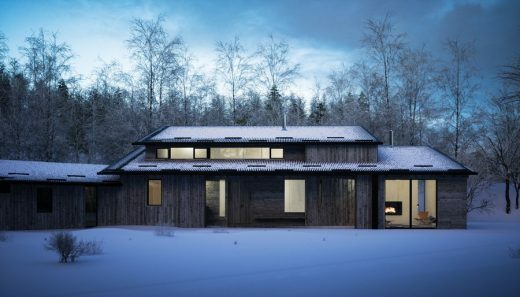 Nestled in a manmade bowl carved out of the landscape, Quarry House is concealed from public view in a wooded site in the Cairngorms National Park in one of the remotest parts of the Highlands of Scotland. 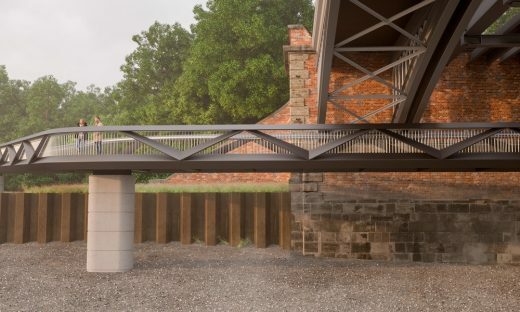 Moxon Architects have completed Castle Green Bridge, located in the grounds of a scheduled ancient monument, in the market town of Taunton. The Bridge has been shortlisted for a BCIA [British Construction Industry Award] as well as being shortlisted for an RIBA award and was the winner of the ACE [Association of Consulting Engineers] ‘Constructing Excellence Award’. Moxon Architects have received planning permission for Oliver’s Place Preston, a new 40,000 square foot commercial development with associated car parking. Planning has been granted for a four storey office building and a multi-deck car park. Moxon’s design offers a visually distinctive architectural style that is intended to be an exemplar of its kind with a strong visual presence. The scheme as a whole, including the surface and multi deck car parking facilities, will make full use of the opportunity presented by this high profile site to dramatically improve the character and quality of the area. Moxon Architects are based in London and Scotland. Their overriding ambition is to bring architectural intelligence to bear on as wide a range of projects as possible, irrespective of scale or budget. To this end the practice actively pursues work in markedly different fields – current clients include organizations as varied as Somerset County Council, The Arts Council England and The Royal Parks Foundation. In all instances we consciously attempt to apply imagination and enthusiasm; expressly not for the sake of novelty or uniqueness; but in order to provide our clients with the best and most appropriate design work that we can achieve.